With spring coming to an end, time is running out to prepare for the summer season. Preparing for summer can mean cleaning out your closet to make room for your summer wardrobe, putting away winter clothing, and cleaning your house. With the summer heat coming soon, it’s important to ensure your house is ready. The single most important thing in your house that you should get ready for summer is your HVAC system. A well-maintained HVAC system will provide you with the comfort of cool air even on the hottest summer days. Now is the perfect time to call an HVAC service company and schedule a maintenance appointment. A technician from an HVAC service company can inspect your cooling unit to ensure that it is operating at full efficiency, and diagnose any problems that might be developing. If the technician finds something that needs repair, he can take care of it right away before the unit breaks down. This will prevent your AC system from breaking down on the hottest summer days and leaving you sweltering in the summer heat. 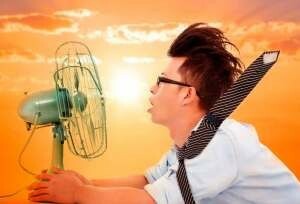 Waiting lists for HVAC repair can be quite long on hot days, so it is prudent to ensure that your system is operating perfectly now, before it gets too hot. Humidifiers are air quality devices that come in many forms. Their use is not restricted to summer, and they can be quite helpful in the winter months as well, helping to add moisture to air that has been dried out by your heating system. If you live in an area with humid summer, a humidifier may not be necessary. However, HVAC systems can often dry out the air in your house, which can cause respiratory irritation and exacerbate allergies. A humidifier can add a fine mist to the air in your house, increasing humidity levels and helping you to stay healthy and comfortable. HVAC systems have air filters that should be changed as often as needed. Just prior to the start of summer is a good time to change the air filter, because your HVAC system will be working hard over the coming months, and you want to ensure that it is moving clean, cool air into your home. Be sure to check the air filter in your HVAC system and replace it if needed. A technician from an HVAC service company can check the air filter and replace it for you during his spring check of your system. During the milder temperatures of spring, you should have the opportunity to air out your home. Take advantage of it while you can, since the summer months come bringing heat that will make you want to keep all your windows shut tight. Take some time in the spring to open all your windows and enjoy the fresh air. As the air circulates throughout your house, it will help remove any odors and prevent mold and mildew inside your home. Air leaks in your home can make living in your home uncomfortable during summer and winter months alike. When you have air leaks somewhere in your house, the precious cool air you need to be comfortable will rush out of your house as soon as your HVAC system produces it. Check all your doors and windows and make sure that there are no drafts or gaps around the window and door frames. Door frames and window stripping are areas that are often in need of repair, so check carefully. Taking the time to inspect and repair these areas can reduce your heating bill and ensure your house is comfortable during the hot summer months.